I just returned from my stint with The Stringdusters. Risking understatement, it was f-u-n.
A lot of the topics discussed among 10 guys in a 12 passenger van over 6 days can get a bit out of control, but this tour packed its fair share of serious vanversations. The Stringdusters are at a pivotal point in their scene, which led to some really great talking points. Chris Pandolfi (banjo for The ‘Dusters) and I were filming and documenting the tour for their upcoming live album release. A few days before hitting the road, Chris wrote a Bluegrass “manifesto” of sorts in which he discusses the current state of Bluegrass as a brand of music — specifically about how the scene is changing and evolving in a genre that has always been known to be very traditional. It was a big topic and the overall arc of the tour, the essence of which Chris captured nicely here on his website. 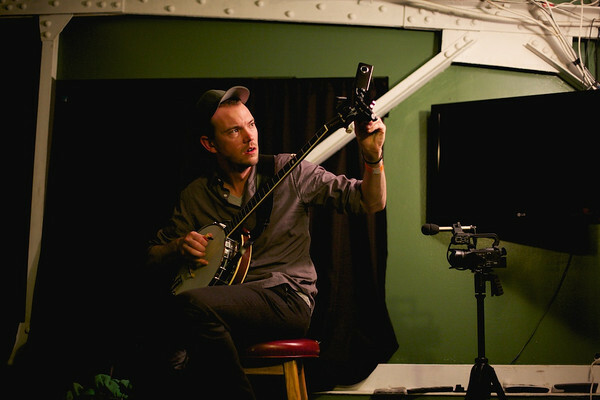 Here’s a shot of Chris tuning up the world’s first “Banjo-Cam” backstage before the show in Boston.